Darlington is a city located in Darlington County, South Carolina, United States. In 2016, its population was 6,117. It is the county seat of Darlington County. It is part of the Florence, South Carolina Metropolitan Statistical Area. Darlington is known for its Darlington Oak and Spanish moss. Darlington is home to the famous Darlington Raceway, which hosts the annual NASCAR Southern 500 race. It is also the site of the National Motorsports Press Association (NMPA) Hall of Fame. Darlington is also a center for tobacco farming. Darlington is located southeast of the center of Darlington County at 34°18′5″N 79°52′7″W (34.301370, -79.868659). U.S. Routes 52 and 401 bypass the city on the southwest. US 52 leads southeast 10 miles (16 km) to Florence, US 401 leads southwest 38 miles (61 km) to Sumter, and the two highways together lead 17 miles (27 km) north to Society Hill. South Carolina Highway 34 passes through the center of Darlington, leading east 36 miles (58 km) to Dillon and west 23 miles (37 km) to Bishopville. 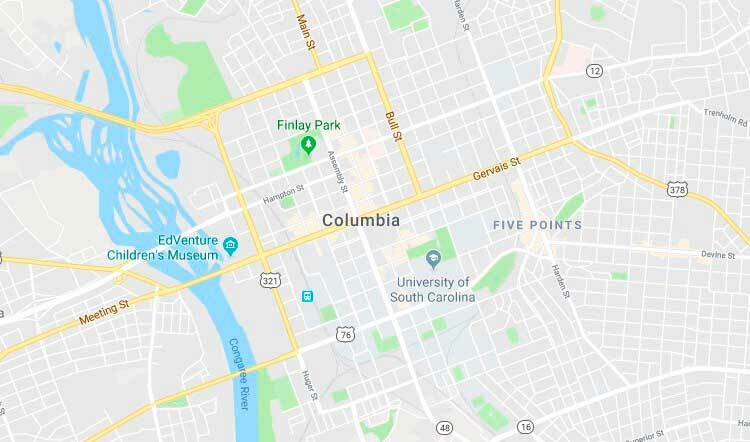 Columbia, the state capital, is 76 miles (122 km) to the west. Darlington Raceway is located on the western outskirts of town, 2 miles (3 km) west of the city center along SC 34/151. According to the United States Census Bureau, Darlington has a total area of 4.6 square miles (11.8 km²), all land. As of the 2010 United States Census, there were 6,289 people residing in the city. The racial makeup of the city was 60.4% Black, 37.7% White, 0.2% Native American, 0.4% Asian, 0.1% from some other race and 0.5% from two or more races. 0.7% were Hispanic or Latino of any race. As of the census of 2000, there were 6,720 people, 2,812 households, and 1,765 families residing in the city. The population density was 1,565 people per square mile (604.8/km²). There were 3,140 housing units at an average density of 731.7 per square mile (282.6/km²). The racial makeup of the city was 56.04% African American, 42.50% White, 0.16% Native American, 0.36% Asian, 0.01% Pacific Islander, 0.51% from other races, and 0.42% from two or more races. Hispanic or Latino of any race was 1.01% of the population.